Aluminium Bahrain (Alba) may look into an additional listing of its shares in Saudi Arabia, in what would be the latest blow to Bahrain’s stock market which has suffered from low trading volumes since the financial crisis, reports Reuters. Such a move would also emphasise the draw of Saudi Arabia’s bourse, which is by far the largest in the Gulf region and is in the spotlight ahead of opening up to foreign investors for the first time in 2015. Alba said in a bourse filing it might conduct a review into an additional listing in Saudi Arabia, but that no decision had been taken. The statement followed a Bloomberg report that Alba was planning to list its shares in Saudi Arabia in order to help raise its market value. Since listing in November 2010 and spending its first year trading around the initial offer price of BD0.9 ($2.36) per share, Alba’s stock has struggled. Recently, the fourth-largest stock by market value in Bahrain closed at BD0.505 ($1.32), giving it a market capitalisation of around $1.87 billion. Bahrain’s bourse has been plagued by low trading volumes for years, which impacts the attractiveness of companies listed on it to investors and their stock prices. The Bahraini benchmark index is up 23.4 per cent year-to-date but its value is almost unchanged from November 2010 and half the level of June 2008. By contrast, most other Gulf markets have recovered most of the value lost since the 2008 slump, including Saudi Arabia which is more than 10 per cent up on June 2008 levels. Alba is 69.4 per cent owned by Bahraini sovereign wealth fund Mumtalakat, with Saudi Basic Industries Corp (Sabic), holding 20.6 per cent of the company. In addition to a primary listing on the Bahrain Bourse, Alba has global depositary receipts traded in London. In other Alba news, the company received the 2014 Gold Occupational Health and Safety Award from the Royal Society for the Prevention of Accidents (RoSPA) at a ceremony at the Hilton Glasgow. 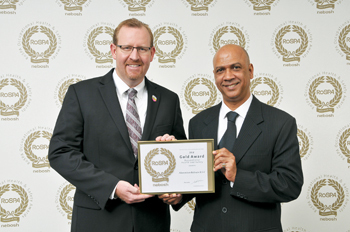 The award was presented to Alba’s chief executive officer, Tim Murray, and the senior manager for safety, health and environment, Abdulla Yaqoob Senan. Three of Alba’s Bahraini employees have been certified as Lean Six Sigma Black Belts by McKnight Gracie Management Consultants (UK). They are: Isa Ishaq for improvements in the casthouse furnace reliability project, Hussain Dawood for the gas turbine outage optimisation project and Faisal Raffii for the billet defect reduction project. The employees achieved their Black Belt certifications in Lean Six Sigma by combining their knowledge of standard operating procedures with newly acquired skills of Lean Six Sigma to identify areas of improvement and suggest and implement appropriate solutions. “Alba’s success lies in the empowerment and professional development of its national workforce,” Murray said. “We are proud of our employees’ achievement - they represent the commitment of Alba towards strengthening talent management and its core values of achieving operational efficiency, global competitiveness and social responsibility along with superior customer service. “The Lean Six Sigma philosophy will enable Alba to leverage cost improvements within the on-going Titan Programme and prepare the company to be better able to face future challenges of profitable growth,” he said. Till date, Alba has achieved a level of five certified Master Black Belts, three certified Black Belts and 32 certified Green Belts. In addition, the company has also achieved a level of 336 trained Green Belts and 12 trained Black Belts, who are potential certification candidates. The company announced the latest batch of the Training and Development Programme (TDP) for employees from its Power Group. A total of 25 employees from various departments in Power have been selected to undergo the TDP, which will be conducted by the Power Group along with the training and recruitment department. Upon completion, the selected candidates will be entrusted with greater responsibilities and management positions such as supervisor, engineer, senior shift charge engineer, planner and so on. As a complement to this initiative, Alba will sponsor the advanced education such as HND, BSc and MBA with universities in Bahrain as well as overseas of the selected employees. Alba reaffirmed its commitment towards programmes that empower youth by sponsoring inJAz Bahrain’s 9th annual ceremony. A member of the worldwide organisation Junior Achievement, inJAz Bahrain is a non-profit society-driven initiative by the private sector with the aim of empowering Bahraini youngsters with the knowledge, skills and hands-on experience required to compete in a global economy. The company organised a tour of its recently inaugurated datacentre for members of the Technology and Business Society (TBS). Alba held various health sessions for its employees during the month of August. These included two key sessions, one on the Ebola virus and the other on healthy diets and food. The company also welcomed Gebal Al Maraghi, chairman of the Egyptian General Federation of Trade Unions and member of Egypt’s House of Representatives and Shura Council and his team. 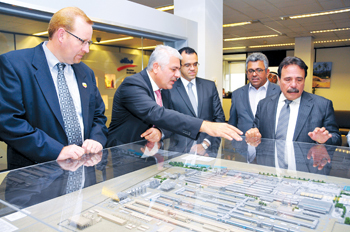 The delegation’s visit to Alba was to highlight the role of unions in preserving the interests of workers and their contributions towards the economic and social growth of the company.